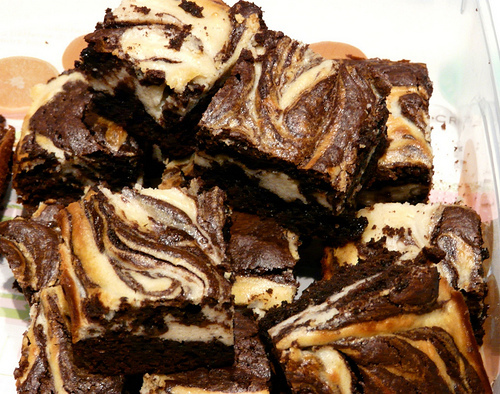 These cream cheese brownies are geared towards the mature crowd and packed with flavor. Serve warm with a scoop if your favorite vanilla ice cream and a hot mug of Irish coffee! They can also be made into single serve portions by creating "brownie cupcakes" in muffin tins. Preheat oven to 350 degrees F. Spray a 9-by-13-inch glass baking dish with nonstick cooking spray. Set aside. Combine brownie mix with eggs, oil and Amaretto and mix until well blended. Spread in the prepared baking dish. Place cream cheese, softened butter, sugar, eggs, flour and Amaretto in a large bowl and beat by hand or with an electric mixer until smooth. Pour over brownie layer, swirl with the tip of a knife, and bake for 30 to 35 minutes. Set aside to cool, serve or store in the refrigerator.